Understand the three types of control systems. Know the strengths and weaknesses of common management fads. In addition to creating an appropriate organizational structure, effectively executing strategy depends on the skillful use of organizational control systems. Executives create strategies to try to achieve their organization’s vision, mission, and goals. Organizational control systems allow executives to track how well the organization is performing, identify areas of concern, and then take action to address the concerns. Three basic types of control systems are available to executives: (1) output control, (2) behavioral control, and (3) clan control. Different organizations emphasize different types of control, but most organizations use a mix of all three types. Output control focuses on measurable results within an organization. Examples from the business world include the number of hits a website receives per day, the number of microwave ovens an assembly line produces per week, and the number of vehicles a car salesperson sells per month (Figure 9.16 “Output Controls”). In each of these cases, executives must decide what level of performance is acceptable, communicate expectations to the relevant employees, track whether performance meets expectations, and then make any needed changes. In an ironic example, a group of post office workers in Pensacola, Florida, were once disappointed to learn that their paychecks had been lost—by the U.S. Postal Service! The corrective action was simple: they started receiving their pay via direct deposit rather than through the mail. Many times the stakes are much higher. In early 2011, Delta Air Lines was forced to face some facts as part of its use of output control. Data gathered by the federal government revealed that only 77.4 percent of Delta’s flights had arrived on time during 2010. This performance led Delta to rank dead last among the major U.S. airlines and fifteenth out of eighteen total carriers (Yamanouchi, 2011). In response, Delta took important corrective steps. In particular, the airline added to its ability to service airplanes and provided more customer service training for its employees. Because some delays are inevitable, Delta also announced plans to staff a Twitter account called Delta Assist around the clock to help passengers whose flights are delayed. These changes and others paid off. For the second quarter of 2011, Delta enjoyed a $198 million profit, despite having to absorb a $1 billion increase in its fuel costs due to rising prices (Yamanouchi, 2011). Output control also plays a big part in the university experience. 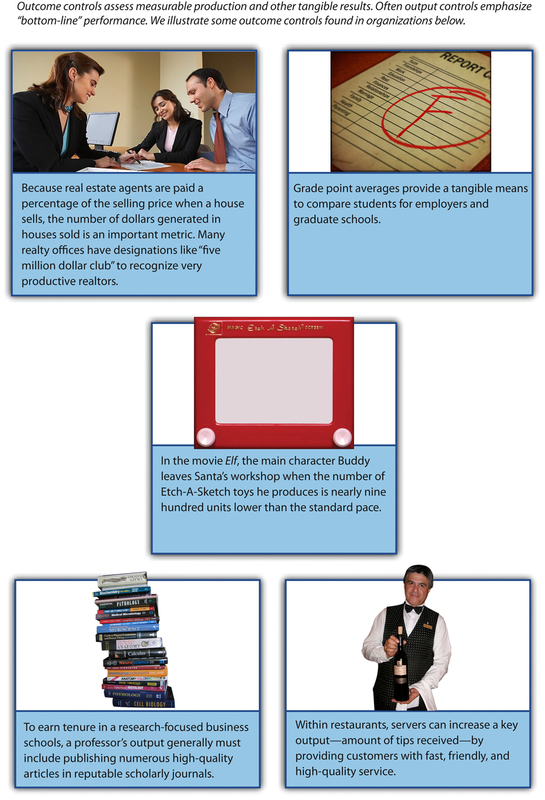 For example, test scores and grade point averages are good examples of output measures. If you perform badly on a test, you might take corrective action by studying harder or by studying in a group for the next test. At colleges and universities, students may be put on academic probation when their grades or grade point average drops below a certain level. If their performance does not improve, they may be removed from their major and even suspended from further studies. On the positive side, output measures can trigger rewards too. A very high grade point average can lead to placement on the dean’s list and graduating with honors. 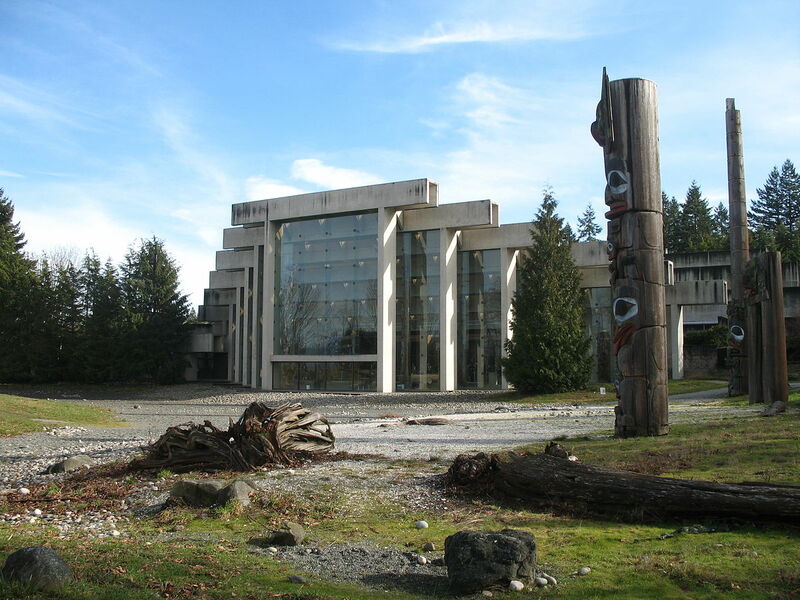 Arthur Erickson, noted Canadian architect, graduated from University of British Columbia and was commissioned to design the Museum of Anthropology there, which opened in 1976. It was inspired by the post-and-beam architecture of northern Northwest Coast First Nations people. While output control focuses on results, behavioral control focuses on controlling the actions that ultimately lead to results. In particular, various rules and procedures are used to standardize or to dictate behavior (Figure 9.18 “Behavioral Controls”). 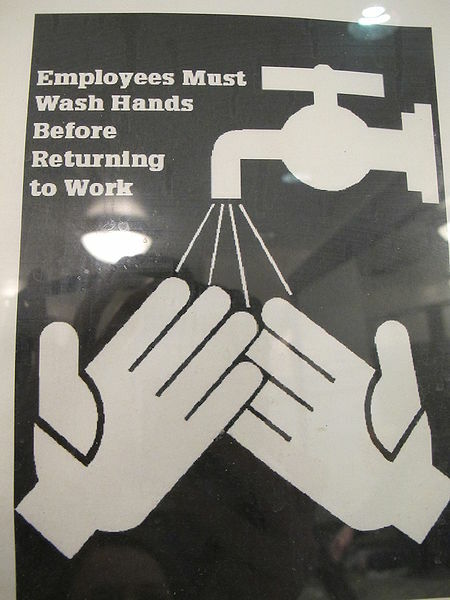 In most states, for example, signs are posted in restaurant bathrooms reminding employees that they must wash their hands before returning to work. The dress codes that are enforced within many organizations are another example of behavioral control. 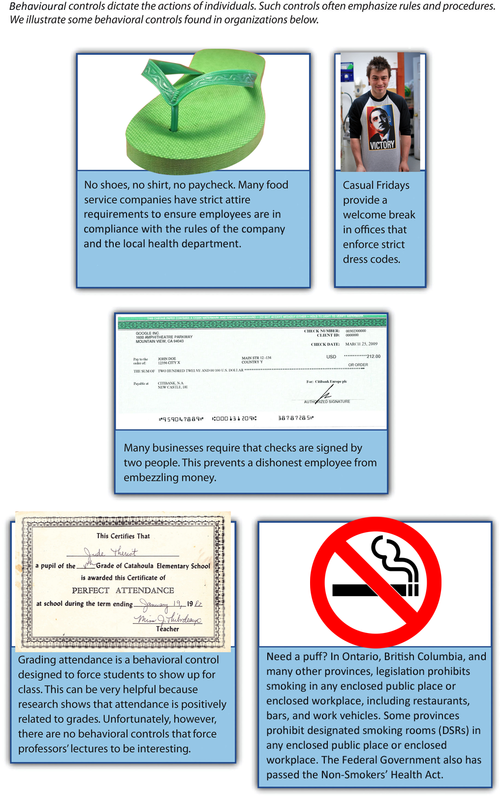 To try to prevent employee theft, many firms have a rule that requires checks to be signed by two people. Some employers may prefer non-smoking employees, as cigarette breaks can take as much as 40 minutes out of a workday, plus higher absenteeism and associated health costs for smokers. Output control also plays a significant role in the university experience. An illustrative (although perhaps unpleasant) example is penalizing students for not attending class. Professors grade attendance to dictate students’ behavior; specifically, to force students to attend class. Meanwhile, if you were to suggest that a rule should be created to force professors to update their lectures at least once every five years, we would not disagree with you. Outside the classroom, behavioral control is a major factor within university and college athletic programs. The Canadian Collegiate Athletic Association (CCAA) governs college athletics using a set of rules, policies, and procedures. CCAA members, all players, and coaches are expected to follow the standard guidelines and principles of the CCAA Code of Ethics, and failure to comply will result in disciplinary action. Some degree of behavioral control is needed within virtually all organizations. Creating an effective reward structure is key to effectively managing behavior because people tend to focus their efforts on the rewarded behaviors. Problems can arise when people are rewarded for behaviors that seem positive on the surface but that can actually undermine organizational goals under some circumstances. For example, restaurant servers are highly motivated to serve their tables quickly because doing so can increase their tips. But if a server devotes all his or her attention to providing fast service, other tasks that are vital to running a restaurant, such as communicating effectively with managers, host staff, chefs, and other servers, may suffer. Managers need to be aware of such trade-offs and strive to align rewards with behaviors. For example, wait staff who consistently behave as team players could be assigned to the most desirable and lucrative shifts, such as nights and weekends. Figure 9.19: Although some behavioral controls are intended for employees and not customers, following them is beneficial to everyone. Instead of measuring results (as in outcome control) or dictating behavior (as in behavioral control), clan control is an informal type of control. 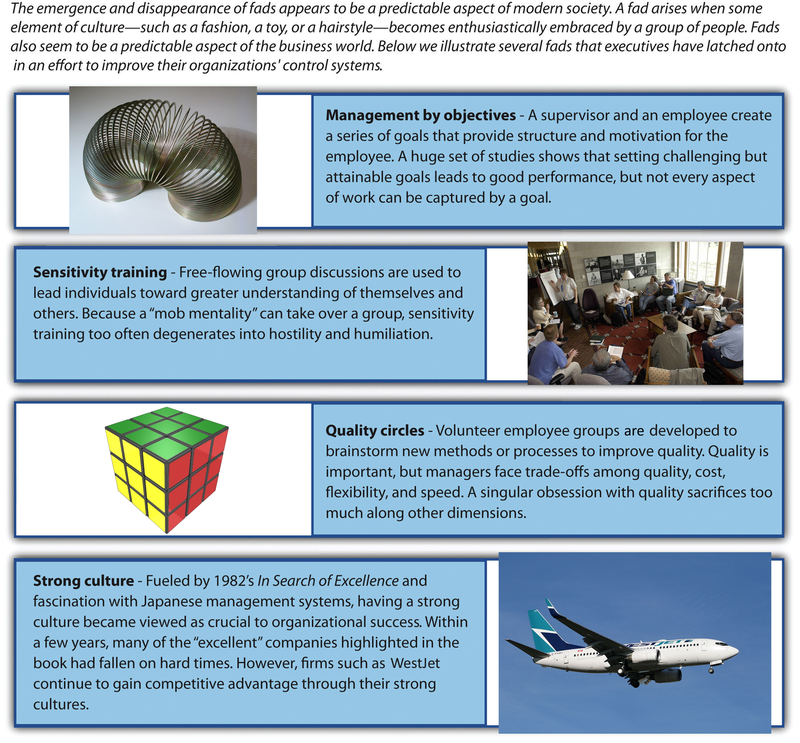 Specifically, clan control relies on shared traditions, expectations, values, and norms to lead people to work toward the good of their organization (Figure 9.20 “Clan Controls”). Clan control is often used heavily in settings where creativity is vital, such as many high-tech businesses. In these companies, output is tough to dictate, and many rules are not appropriate. The creativity of a research scientist would be likely to be stifled, for example, if he or she were given a quota of patents that must be met each year (output control) or if a strict dress code were enforced (behavioral control). Google is a firm that relies on clan control to be successful. Employees are permitted to spend 20 percent of their work week on their own innovative projects. The company offers an ‘‘ideas mailing list’’ for employees to submit new ideas and to comment on others’ ideas. Google executives routinely make themselves available two to three times per week for employees to visit with them to present their ideas. These informal meetings have generated a number of innovations, including personalized home pages and Google News, which might otherwise have never been adopted. 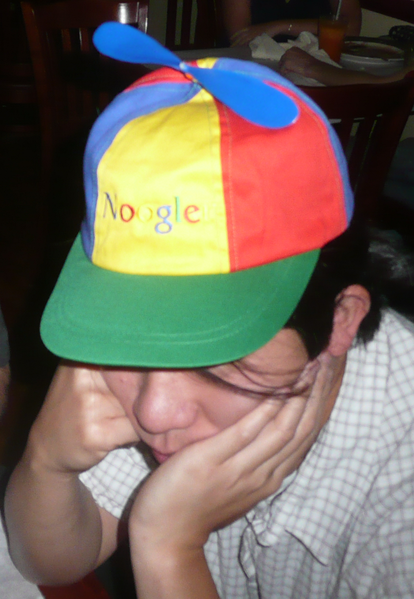 Figure 9.21: As part of the team-building effort at Google, new employees are known as Noogles and are given a propeller hat to wear. Some executives look to clan control to improve the performance of struggling organizations. In 2014, Rogers Communications CEO Guy Laurence formally unveiled his plan to revitalize growth at the country’s largest communications firm. The strategy, dubbed “Rogers 3.0,” aimed to improve the customer experience and use the company’s assets—which include everything from magazines to the Toronto Blue Jays—together in a more effective way. Laurence explained the issues he believed the company struggles with, and how his plan will address them. The reorganization is aimed at focusing on better customer service by bringing together all of the elements of customer experience—10,400 staff—into a single unit reporting to him. In plans to improve customer service to business and enterprise customers, Rogers has split out consumers from enterprise users, believing there’s a growth story in enterprise. Finally, Laurence said that Rogers’ stable of sports, broadcast, and publishing properties would differentiate the company from its telecom peers and commented, “I believe content is the most important part of our mix” (Castaldo, 2014). Clan control is also important in many Canadian cities. Vancouver has the steam clock and Wreck Beach; Toronto has the CN Tower and the Blue Jays; Edmonton has the Oilers and West Edmonton Mall. These attractions are sources of pride to residents and desired places to visit for tourists; they help people feel like they belong to something special. It is worth noting that control systems, once embedded in an organization, become very difficult to change. Control systems emerged within an organization, not by accident, but in response to the firm’s need to monitor employees’ work to encourage high performance. Changing results metrics is an invitation for gaming the data with employees finding innovative ways to ensure that the data shows they are performing at the expected level, while behavior and clan culture are notoriously difficult to change, often taking a decade or more to truly change. New senior executives often tweak control systems in an effort to improve performance. However, the time required to actually implement such changes often exceeds the executive’s tenure with the firm—thus the phrase, latest (management) fad. Management Fads: Out of Control? Don’t chase the latest management fads. The situation dictates which approach best accomplishes the team’s mission. The emergence and disappearance of fads appears to be a predictable aspect of modern society. A fad arises when some element of popular culture becomes enthusiastically embraced by a group of people. Over the past few decades, for example, fashion fads have included leisure suits (1970s), “Members Only” jackets (1980s), Doc Martens shoes (1990s), and Crocs (2000s). Ironically, the reason a fad arises is also usually the cause of its demise. The uniqueness (or even outrageousness) of a fashion, toy, or hairstyle creates “buzz” and publicity but also ensures that its appeal is only temporary (Ketchen & Short, 2011). Fads also seem to be a predictable aspect of the business world (Figure 9.22 “Managing Management Fads”). As with cultural fads, many provocative business ideas go through a life cycle of creating buzz, captivating a group of enthusiastic adherents, and then giving way to the next fad. Bookstore shelves offer a seemingly endless supply of popular management books whose premises range from the intriguing to the absurd. Within the topic of leadership, for example, various books promise to reveal the “leadership secrets” of an eclectic array of famous individuals such as Jesus Christ, Hillary Clinton, Attila the Hun, and Santa Claus. Beyond the striking similarities between cultural and business fads, there are also important differences. Most cultural fads are harmless, and they rarely create any long-term problems for those that embrace them. In contrast, embracing business fads could lead executives to make bad decisions. As the quote from Colin Powell suggests, relying on sound business practices is much more likely to help executives to execute their organization’s strategy than are generic words of wisdom from Old St. Nick. Many management fads have been closely tied to organizational control systems. For example, one of the best-known fads was an attempt to use output control to improve performance. Management by objectives (MBO) is a process wherein managers and employees work together to create goals. These goals guide employees’ behaviors and serve as the benchmarks for assessing their performance. Following the presentation of MBO in Peter Drucker’s 1954 book The Practice of Management, many executives embraced the process as a cure-all for organizational problems and challenges as if previous management had not been concerned with their objectives! Like many fads, however, MBO became a good idea run amok. Companies that attempted to create an objective for every aspect of employees’ activities eventually discovered that this was unrealistic. The creation of explicit goals can conflict with activities involving tacit knowledge about the organization. Intangible notions such as “providing excellent customer service,” “treating people right,” and “going the extra mile” are central to many organizations’ success, but these notions are difficult if not impossible to quantify. Thus, in some cases, getting employees to embrace certain values and other aspects of clan control is more effective than MBO. Quality circles were a second fad that built on the notion of behavioral control. Quality circles began in Japan in the 1960s and were first introduced in the United States in 1972. A quality circle is a formal group of employees that meets regularly to brainstorm solutions to organizational problems. As the name “quality circle” suggests, identifying behaviors that would improve the quality of products and the operations management processes that create the products was the formal charge of many quality circles. While the quality circle fad depicted quality as the key driver of productivity, it quickly became apparent that this perspective was too narrow. Instead, quality is just one of four critical dimensions of the production process; speed, cost, and flexibility are also vital. Maximizing any one of these four dimensions often results in a product that simply cannot satisfy customers’ needs. Many products with perfect quality, for example, would be created too slowly and at too great a cost to compete in the market effectively. Thus trade-offs among quality, speed, cost, and flexibility are inevitable. Improving clan control was the aim of sensitivity-training groups (or T-groups) that were used in many organizations in the 1960s. This fad involved gatherings of approximately eight to fifteen people openly discussing their emotions, feelings, beliefs, and biases about workplace issues. In stark contrast to the rigid nature of MBO, the T-group involved free-flowing conversations led by a facilitator. These discussions were thought to lead individuals to greater understanding of themselves and others. The anticipated results were more enlightened workers and a greater spirit of teamwork. Research on social psychology has found that groups are often far crueler than individuals. Unfortunately, this meant that the candid nature of T-group discussions could easily degenerate into accusations and humiliation. Eventually, the T-group fad gave way to recognition that creating potentially hurtful situations has no place within an organization. Hints of the softer side of T-groups can still be observed in modern team-building fads, however. Perhaps the best known is the “trust game,” which claims to build trust between employees by having individuals fall backward and depend on their coworkers to catch them. Improving clan control was the basis for the fascination with organizational culture that was all the rage in the 1980s. This fad was fueled by a best-selling 1982 book titled In Search of Excellence: Lessons from America’s Best-Run Companies. Authors Tom Peters and Robert Waterman studied companies that they viewed as stellar performers and distilled eight similarities that were shared across the companies. Most of the similarities, including staying “close to the customer” and “productivity through people,” arose from powerful corporate cultures. The book quickly became an international sensation; more than three million copies were sold in the first four years after its publication. Soon it became clear that organizational culture’s importance was being exaggerated. Before long, both the popular press and academic research revealed that many of Peters and Waterman’s “excellent” companies quickly had fallen on hard times. Basic themes such as customer service and valuing one’s company are quite useful, but these clan control elements often cannot take the place of holding employees accountable for their performance. 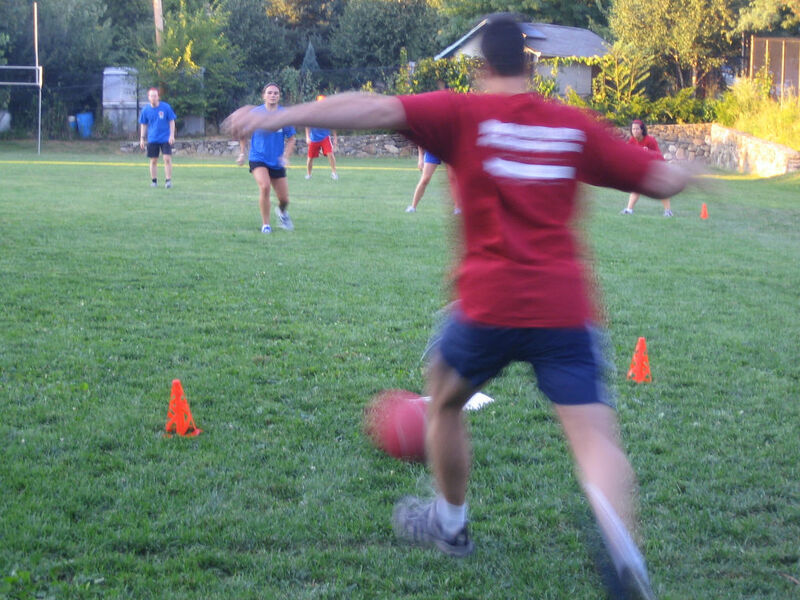 Figure 9.23: Spirited games of kickball can help build an organization’s culture, but such events should not substitute for holding employees accountable for delivering results. The history of fads allows us to make certain predictions about today’s hot ideas, such as empowerment, “good to great,” and viral marketing. Executives who distill and act on basic lessons from these fads are likely to enjoy performance improvements. Empowerment, for example, builds on important research findings regarding employees—many workers have important insights to offer to their firms, and these workers become more engaged in their jobs when executives take their insights seriously. Relying too heavily on a fad, however, seldom turns out well. Organizational control systems are a vital aspect of executing strategy because they track performance and identify adjustments that need to be made. Output controls involve measurable results. Behavioral controls involve regulating activities rather than outcomes. Clan control relies on a set of shared values, expectations, traditions, and norms. Over time, a series of fads intended to improve organizational control processes have emerged. Although these fads tend to be seen as cure-alls initially, executives eventually realize that an array of sound business practices is needed to create effective organizational controls. What type of control do you think works most effectively with you and why? What are some common business practices that you predict will be considered fads in the future? How could you integrate each type of control intro a college classroom to maximize student learning? Creating Organizational Control Systems by Janice Edwards is licensed under a Creative Commons Attribution-NonCommercial-ShareAlike 4.0 International License, except where otherwise noted.